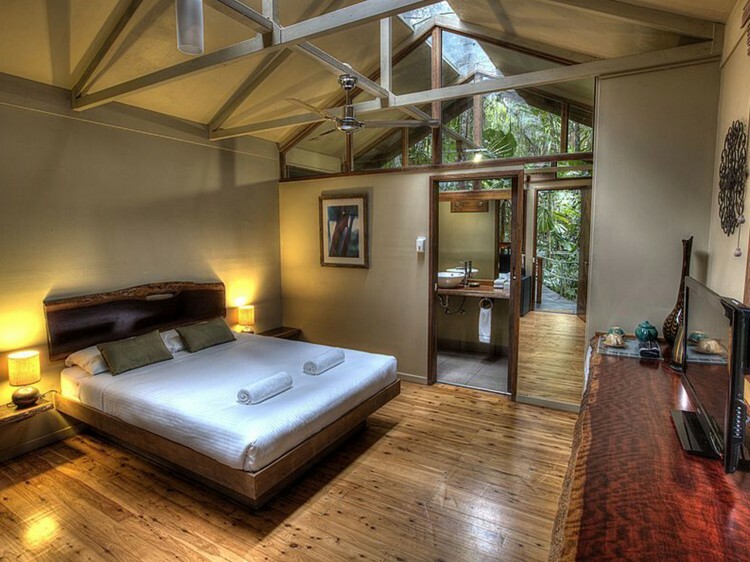 Welcome to the Daintree Wilderness Lodge, your eco-friendly Daintree accommodation. 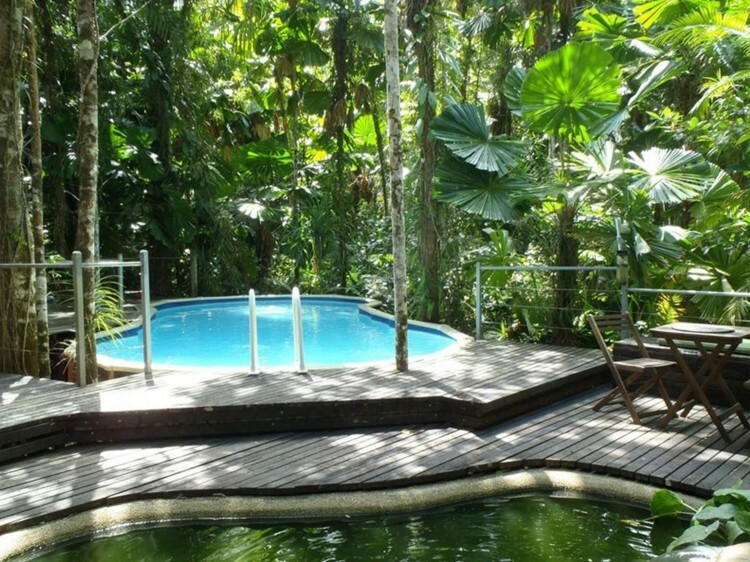 This eco-lodge is surrounded on all sides by the World Heritage listed Daintree National Park and is ideally situated half way between the Daintree River and Cape Tribulation, in the very heart of the worlds oldest rainforest. The Wilderness Lodge has an Advanced Eco Certification ensuring minimal impact on the pristine environment. Being ‘off the grid’ the resort has pioneered techniques to ensure the smallest ecological footprint without sacrificing on the facilities you would expect of accommodation closer to ‘civilisation’. Please note: children over the age of 10 years are welcome. 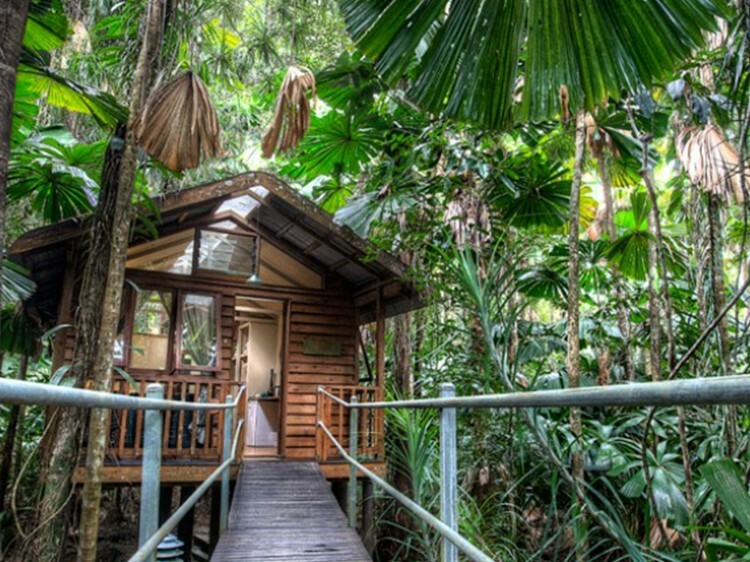 Each of the seven cabins falls within eco-accreditation guidelines ensuring the magnificent views are protected and allows guests to enjoy the animals, sounds and beauty the Rainforest offers. Your cabin sits on stilts with your very own walkway leading you to your front door. Each cabin features a unique viewing sunroof allowing you to gaze up into the rainforest and filling your cabin with beautiful rays of sunshine in the morning and natural light during the day. The cabins are set a fair distance from the next, all tucked away beneath the canopy and under the beautiful fan palms, offering a “canopy coolness” and privacy within your cabin. This enables the Lodge to offer complete comfort and be environmentally friendly without the negative use of air conditioners. 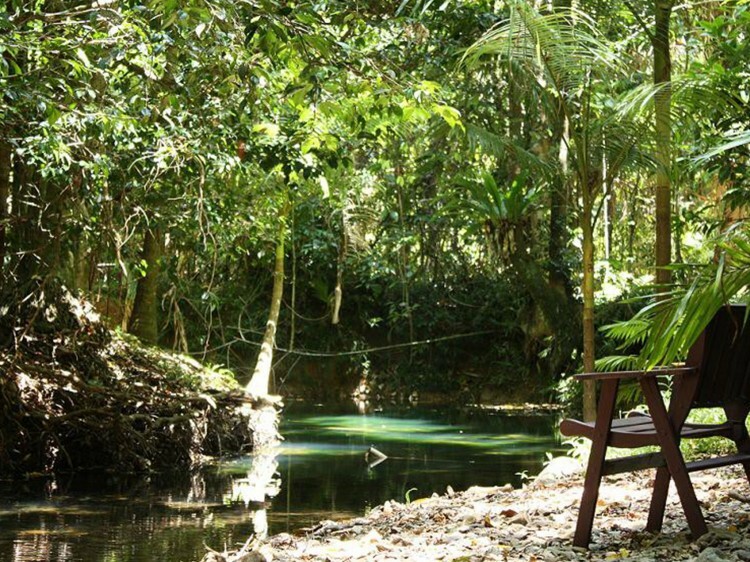 The restaurant is available exclusively to Daintree Wilderness Lodge guests. This ensures that the locally sourced and carefully prepared produce is presented in an intimate and personal setting surrounded by the beautiful rainforest in the unique open air venue. Start your day with an all-inclusive breakfast which includes seasonal tropical fruits, locally grown tea and coffee, mungalli bio-organic dairy produce and free range eggs. A hot option changes daily. Tropical North Queensland is blessed with ideal conditions for harvesting succulent seafood and for growing an abundance of fresh fruit and vegetables. In line with the advanced eco-accreditation, much of the produce is organically grown and locally sourced, all of the dishes are created from the ‘ground up’ free from preservatives and majority gluten free. Evening meals incorporate the best local produce including Wild Barramundi, prawns and King Tiger Prawns from the Gulf of Carpentaria and Atherton Tablelands Prime Beef.